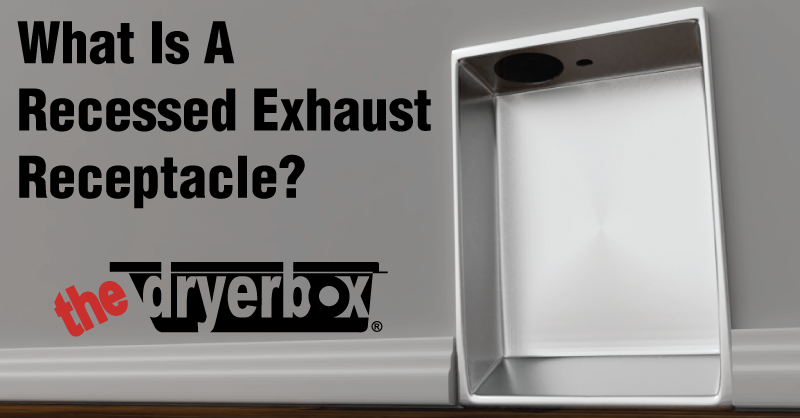 What Is A Recessed Exhaust Receptacle? The technical term is "recessed exhaust receptacle". What exactly does that mean? A recessed exhaust receptacle is a space made within a wall to protect the duct that connects the dryer to the exhaust system. For safety (there are more than 14,000 dryer fires reported each year) and efficiency (dryers can be one of the most expensive appliances to operate), great care needs to be taken in the design of a recessed exhaust receptacle. Most importantly, it needs to be made of material that will withstand a fire. A poorly constructed large opening in the wall, can actually create a chimney effect in the event of a fire. Heavy gauge steel can handle the job and help prevent fire spread. Then it has to be designed to safely guide the transition duct as the dryer is placed flush to the wall. This will ensure that the duct maintains its shape and allows for maximum airflow. Shorter drying times equal energy savings. The Dryerbox is a recessed exhaust receptacle which allows more room behind the dryer in a home. This not only assists in keeping the hose from being crushed but also allows for more space in the laundry room. The dryer can be pushed back flush against the wall using The Dryerbox. Why is this device necessary? With a clear and persistent-sized passageway for the air to escape, the lint is pushed out away from the dryer. This reduces dryer fires. As an added bonus, the easier it is for your dryer to send the air out, the less time it takes to dry your laundry. This decreases your electric bill as well.